When I first moved to the Upper West Side, it seemed empty and sort of lonely—it was winter, and I was usually out-and-about on odd hours, which is both a perk and a downside of self employment. But, now that spring has finally sprung, the sidewalks are packed with people enjoying outdoor cocktails and meals, and the city feels entirely different. I’ve started exploring my neighborhood, and dare I say, the Upper West Side is kind of cool. Or, at least, it’s changing —like the rest of the city—and the vibe and establishments. At least, it has the oysters. 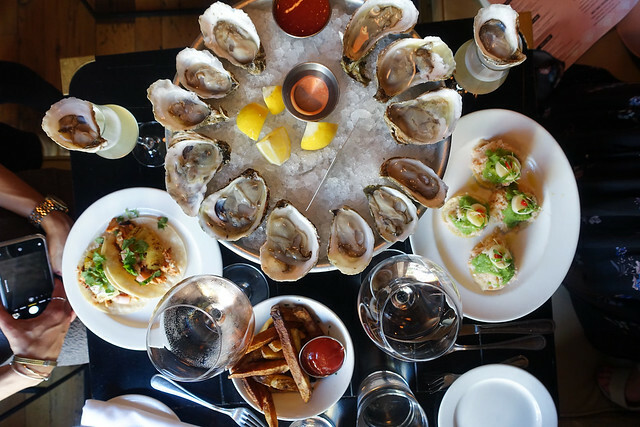 The Mermaid Inn is not far from my spot, and I meandered a few blocks farther to try Crave Fish Bar, which boasts a killer selection of oysters and perhaps the best happy hour on the UWS. I am so pleased with my discovery: dollar oysters, as well as specials on wine, craft cocktails, oyster shooters, and seafood appetizers that are perfect for sharing. 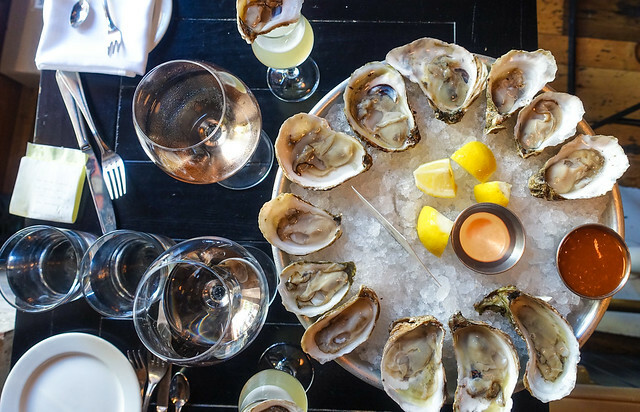 The oyster selection is expansive, with East Coast Oysters like Montauk Point, Blue Island, Black Duck Salt, among others, and West Coast oysters from California, Washington, and British Columbia. 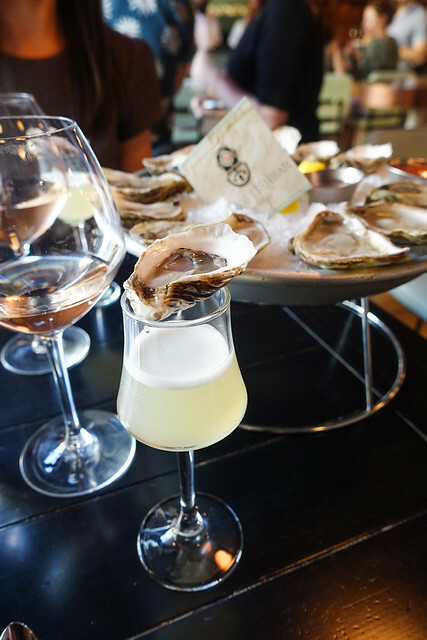 We enjoyed two dozen oysters over our evening—we might have overstayed our welcome— and, in particular, we enjoyed the Baja Kumamoto, the Black Duck Salt, and the Malpeque, from Prince Edward Island. By way of beverages, there’s a reduced selection of beer, wine (vinho verde and prosecco by the bottle), as well as micheladas available on happy hour. This is much more of a place for oysters and cocktails—and who can argue with that? There’s a selection of #Oystergram Craft Cocktails, available for $9, s well as oyster shooters, in three varieties. We were served the Spicy Tequila Oyster shooter, with chile-infused lime and agave. It tasted like a margarita—but a very, very strong one. A couple of sips and I was loopy. The cocktail options are delightful: a “Big Ben” with vodka, grapefruit, and elderflower, a Bloody Mary, and a margarita, which my lady date, Jamie, enjoyed immensely. Meanwhile, I went wild for the Strawberry Sangria, crafted with white wine, strawberry puree, orange, and lemon. It was a thick cocktail—but not very sweet, just fruity, which I loved. I would come back just for this cocktail. The happy hour bites are affordable, by New York standards, ranging from $6 for a taco to $16 for a plate of tostadas. It’s all fish forward, so if you don’t love shellfish this is likely not the place for you. The Al Pastor fish tacos were a Barramundi white fish with rilled pineapple, pickled onion and cilantro. It was a hearty taco, but surprisingly lacking in the flavor, despite the tempting descriptions of cilantro and pineapple. 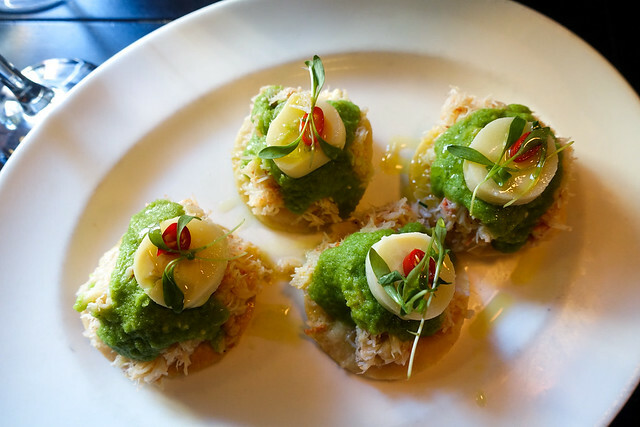 The crab tostadas were fresh and overflowing with fresh crab meat. The French fries were a strong addition to the menu: massive hand-cut, salty fries in the classic style, served with ketchup. 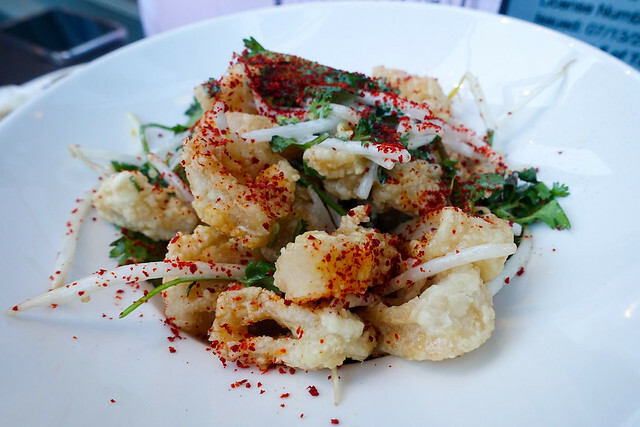 For the gluten-averse, the calamari is a cult favorite in the neighborhood (UWS is filled with healthy folks) and the city in general. The enormous, fluffy calamari is tossed in rice, sprinkled with chili, and served with bean sprouts and a Thai Miso sauce. It’s some of the best calamari I’ve ever had—you could absolutely not tell it was gluten-free, as the rice flour was incredibly fluffy. We overstayed well past happy hour, drinking rosé through dinner hour, as the conversation and the weather were too good to move. This ended up being a very wise decision, as the dessert at Crave Fishbar divine. We selected a carrot cake and a chocolate chip cookie sundae. 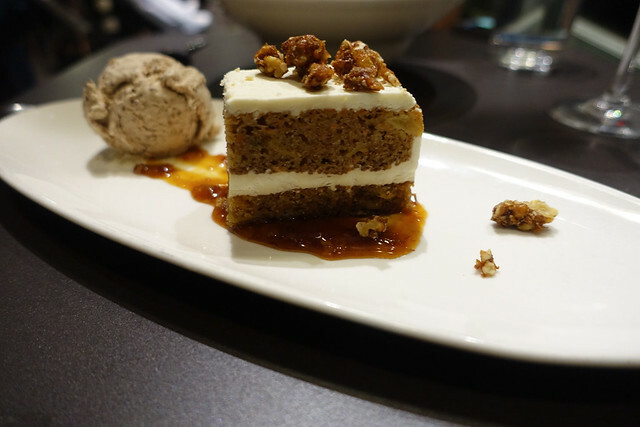 The carrot cake was exceptional—moist, fluffy cake with that token cream cheese frosting, topped with candied walnuts. The accompanying ice cream, which we believe to be fig, we could have done without—the cake was fine on its own. 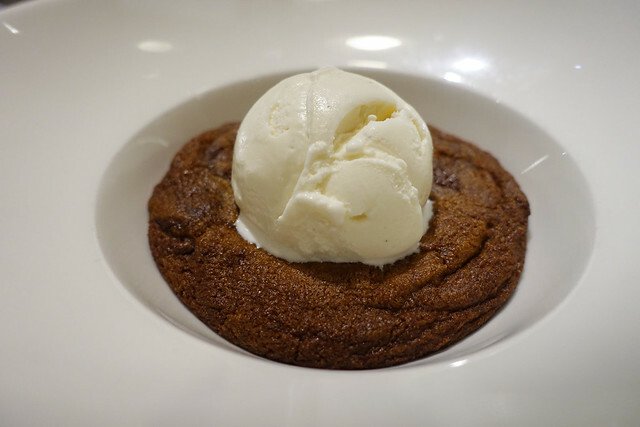 However, the enormous cookie topped with vanilla ice cream was divine—the perfect, classic American dessert that you’d want at a seafood spot. #OYSTERGRAM has some rules. The happy hour runs Monday through Friday from 5-7 p.m. and Saturday and Sunday 4-6 p.m., when each oyster is just one dollar. It’s a popular happy hour, so the restaurant requests your patience as they shuck more than 1,000 oysters at each happy hour. There’s also a minimum order of six, and a maximum order of 36. They also request you “slurp loud, slurp wild, and have fun” as well as share #Oystergram on social media. That we can do, and we’ll be back to do it again!